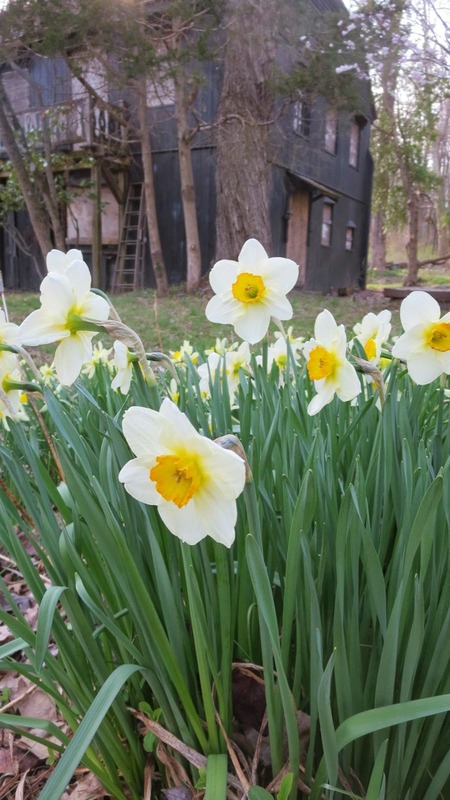 During a recent Rotary Club of Princeton workday at Veblen House, I got a chance to document the many kinds of daffodils that persist on the grounds. No doubt Elizabeth Veblen, shown in this photo from the 1950s, had a lot to do with their presence. Others may have been planted by Garden Club of Princeton volunteers back in the 1970s when they were active there. Some research might reveal cultivar names for all of these subtle variations. Those on the left have whiter petals. Some may have been planted by the Wells, who rented the house from around 1975 to 1998. Not everything blooming is a daffodil. My family's garden in Michigan, bought from the estate of a U of M mathematician, had primroses much like these. Not sure how much can be inferred about mathematicians and primrose from a sample of two. 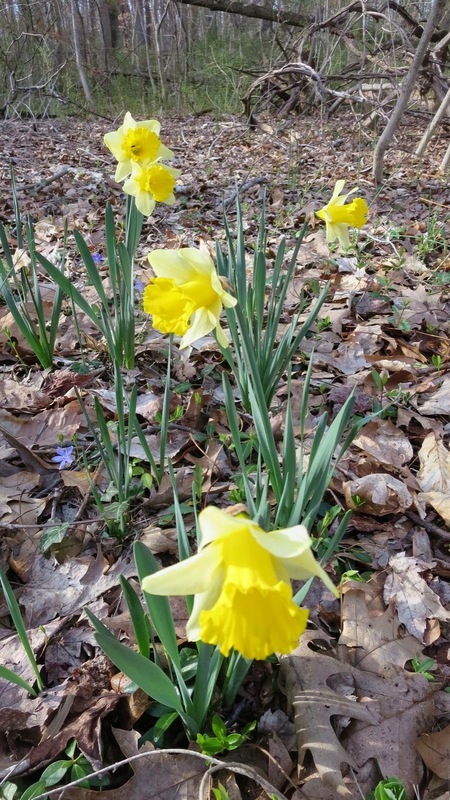 The large lawn hosts remnant populations of daffodils, some of which still bloom. It would be interesting to match up the primrose in the 1950s photos with what remains today. Update, July 30, 2014: According to Bob Wells, Elizabeth Veblen had a plot of land back in what is now woods where she grew the different varieties in rows, for transplanting to the grounds. Some news that didn't get posted earlier: Back in January, two members of the Friends of Herrontown Wood, Kurt Tazelaar and Sally Curtis, received a 2013 Sustainable Princeton Leadership Award for their transformative work to clear trails at Herrontown Wood and Autumn Hill Reservation this past summer and fall. Trails through 200 acres of the Princeton Ridge nature corridor had become blocked by fallen trees and overgrown by invasive shrubs over several years. After getting the green light from Princeton's municipal staff, and using a chain saw, loppers and a scythe, Kurt and Sally spent some 400 volunteer hours making these two beautiful preserves a pleasure to hike through once again. 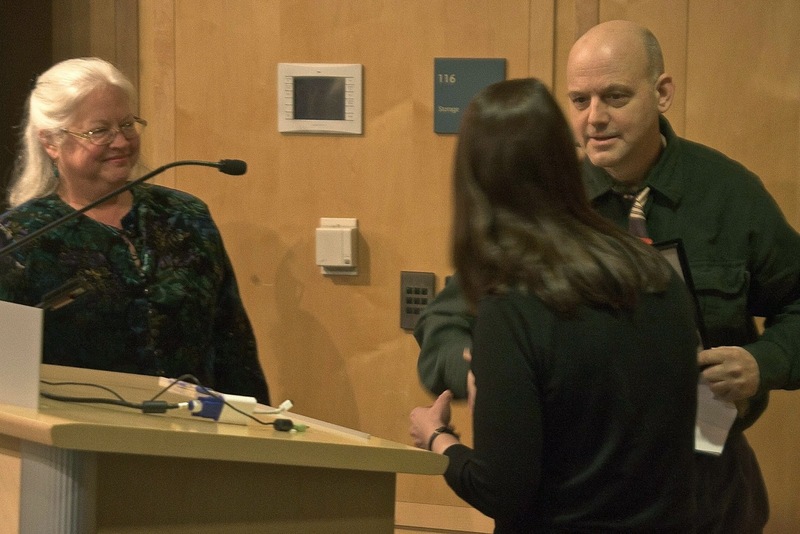 Presenting the awards, Mayor Liz Lempert commended them "for their energetic and inspiring work in clearing trails in 2013, making two Princeton nature preserves inviting and accessible to the public." A post from last August when they were just starting their trail work can be found at this link. They are continuing to work on the trails at Herrontown Wood, to make them more passable in spring when the ground is saturated with water. Congratulations to Kurt and Sally for this much deserved award. After a recent Rotary Club workday at the Veblen House site, one of the volunteers called to us as he was walking down the driveway. Turned out he'd noticed two gaping holes in a white oak, whose size suggested the work of America's largest remaining woodpecker. The Ivory-billed was larger, but hasn't been seen in the southern swamps for decades. The tree must have housed quite a cache of carpenter ants--the Pileated's main source of sustenance--to rationalize all of this chopping. The sound of a pileated's woodpecking is said to be similar to that of someone chopping wood. The impressive size of these woodchips suggest considerable impact. The long corridor of preserved Princeton Ridge woodland, which began with the Veblen's initial donation of 85 acres in 1957 and continues to be built on through local initiative, makes excellent habitat for these impressive birds. This link should take you to photos of baby Pileateds poking their heads out of similar holes.